The writings include obituaries, brief histories of Pike County and of Petersburg, the Lincoln family’s move through Pike County en route to Illinois in 1830, and a sampling of editor Gray’s editorials, and her personal letters. 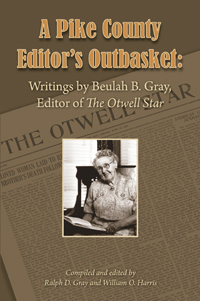 The editors of this book, like Mrs. Gray, are natives of Pike County and graduates of Petersburg High School. The Reverend William O. Harris, an ordained Presbyterian minister, is a graduate of Davidson College in North Carolina and the Princeton Theological Seminary in New Jersey. He also served as the seminary’s first archivist and the head of the Indiana State Library’s genealogy division. Ralph D. Gray is professor emeritus of history at IUPUI. He is a graduate of Hanover College and attended the University of Durham, England. Holding advanced degrees from the University of Delaware and the University of Illinois, he taught history at the university level for nearly forty years in Delaware, Illinois, Ohio, and Indiana, and is the author or editor of more than a dozen books, chiefly on Indiana history.